It's been a busy few days in crypto - and for important elements of the XRP ecosystem. From a liquidity standpoint, crypto is poised to accelerate well above prior levels; new exchanges and easy-to-use apps have been added to the market in 2018, and we've heard about the possibility of super-large players such as LINE wanting to get in on crypto trading. 1 (LINE has 170 million users). While these developments herald the rise of what might be a multi-trillion-dollar market for crypto, XRP holders have even more cause to celebrate, with the opening of SBI's Virtual Currency trade platform to millions of its existing customers. I'll get to that in a minute. So why am I calling this blog entry an "incomplete" XRP newsletter? Because multiple XRP followers have noted something beginning early in 2018; it's impossible to keep up with every community development or XRP ecosystem news item. That's how big this is getting; many XRP community members that stuck around since 2014 can remember a time when we could easily keep up with developments, and we'd look forward to any new morsel of crypto news or developments about XRP with eagerness. Now it's a wealth of news items and developments, and both crypto and XRP are moving at an increasingly fast clip. Before we jump into specific XRP-related headlines from the past few days, it's wise to zoom out and take a look at the biggest news story of the past week; the two US Congressional hearings on cryptocurrency. Two of the biggest news items recently were the separate Congressional hearings regarding cryptocurrency. One was organized by the Subcommittee on Monetary Policy and Trade (Committee on Financial Services). The other one, surprisingly, was sponsored by the US House Agricultural Committee. Both took place on July 18th. What is the subcommittee on Monetary Policy and Trade in the United States? "Among other issues, the subcommittee is responsible for oversight of the Federal Reserve System, as well as domestic and international monetary policy." And it became quickly apparent from the content of the hearing that the purpose was to more fully explore the possibility or form that a US Central Bank-issued virtual currency could take. Once I realized this was the main gist of the hearing, I started to listen in very carefully to the testimony. "It seems likely that the use of cash will continue to fall, and it's worth noting that there is a tipping point at which, even if consumers seek to use cash, businesses and banks will not want to deal with it. what happens then? One possibility is that people will be content to transact primarily in commercial bank deposits, and things will be 'business as usual' with a much smaller cash component to the monetary base. Another possibility is that people will demand direct access to some form of digital, central bank-issued money as a replacement for cash. And a third possibility is that people will turn to privately-issued cryptocurrencies like Bitcoin. These options are not mutually-exclusive, nor are they independent." This was one of the most accurate assessments of the near-term future of how cryptocurrency will meld with state-issued digital assets. While central-bank-issued digital currency would be just that - a counterparty digital asset, it's also likely that some percentage of the citizenry will still prefer to transact in a non-central-bank-issued currency. "I think, to have a central-bank digital cryptocurrency is one of the worst financial ideas of recent times.... I don't think the fundamental nature of money will change; it will surely be the monopoly issuance by a central bank.... and as we consider all this, an increase in the monopoly power of central banks - which already have too much - should be avoided." "If you think about the previous Congressman's question (Mr. Sherman), about 'what is the point of cryptocurrencies,' there are many inefficiencies that lurk in the financial system, including ones that result in crisis, but also if you think about payments, either using your Visa; if you think about cross-border settlement of transactions; those are painfully slow sometimes, and expensive. These technologies, in principle, provide a way of getting around those issues. They, in principle.... could make transactions much easier to verify... to follow through, they could insure finality of settlement of transactions, and bring down the cost. We're not quite there yet, but that's the prospect." It's obvious when Dr. Prasad was speaking that he was talking about the same inefficiencies that XRP was specifically created to address, which was very exciting to hear. Do I believe that XRP will become the national currency for the United States? No. But do I believe that XRP will play an integral role in cross-border value transfer as a bridge asset between central-bank issued digital assets? Absolutely. It would also not surprise me if smaller nations decide to adopt an existing digital asset as a national currency to accelerate their own economy. When would this happen? Not in the near term; However, I predict it might happen if one or more cryptocurrencies reach a certain level of liquidity, adoption, volume, and lower volatility. More hedging instruments will help with this, as well as better globalized and standardized treatment of digital assets. Eventually, many years later in 1974, the federal government then created the Commodity Futures Trading Commission, or CFTC, to regulate futures trading. The Chairman of the House Agriculture Committee is Michael Conaway, Republican-Texas. "... In Afghanistan, for example, 'Code to Inspire' helps train young women for technical careers, and pays them in Bitcoin, which they can use in local shops as well as global marketplaces. In a place where women's banking and physical agency is limited, financial autonomy and digital inclusion is a powerful force for equality and democracy." "... there's also several more experimental projects that are interesting. For example, using economic incentives to battle fake news. Cryptocurrency micropayments as an alternative business model to data-hungry online advertising; and fluid marketplaces for unused disk space on your home computer as a disruptive force to centralized cloud storage. These projects, all launched as initial coin offerings - ICOs - either on a new single-purpose blockchain, or as a token on top of an existing network like Ethereum, are often compared to the Internet startup boom of the 90's." She also warned that if any central bank creates a cryptographically-secure centrally-issued digital asset, that only the best and strongest cryptography - without any centralized back door - be used. She cautioned that if this warning is not heeded, the US financial system could make a very attractive target for hackers. It was a comment that I immediately agreed with, and mentally noted that perhaps her testimony would have also been meaningful in the other panel discussion regarding central bank-issued virtual currency. "This technology does have the potential to be trans-formative. One of the questions I get asked a lot is 'why don't we just call these things securities? We have securities regulation. We could create a scenario where these things get registered, and these things become 'freely trade-able,' so why not just call them securities and deal with the existing laws? I think the problem with that is... they exhibit some characteristics of securities during certain phases, and not in others; and especially when we get to full functionality - when it's a truly completed product that is being sold. The intention of that product is to be used in a network. And that really can't happen, at least not at the speed of software, which is really the fundamental principle behind these decentralized protocols. It's to allow for value transfers truly at the speed of software. You can't do that if everybody's got to be a broker-dealer and the intermediaries have to interact in a way that would be appropriate for securities." Of course, I couldn't agree more with his statement. The United States should move deliberately, carefully, but also with all necessary speed to make certain that blockchain technology companies don't relocate off-shore due to regulatory uncertainty. This viewpoint was echoed by the panelists at different times. "Mr. Ness, I come from the flip-phone part of North California..."
"Would you touch upon what it would look like if that token is determined to be a security?" (Lowell Ness) "Yeah, I think the issue really comes down to friction. While we can get to a status of free trading securities by registering them, even when you do get to that status, there (is) all sorts of ancillary friction ... in and around the transfer of a security; you need to have broker-dealers involved. And you need to have suitability requirements. And other potential disclosure issues, and so forth that are ongoing... and so when we're talking about trying to create the next generation of decentralized protocol layer of apps on top that are all interoperable, interacting with each other and transferring value at the speed of software, to deliver a service to a consumer... it may be all transparent to the consumer, that this is all happening under the hood, but you can't have fundamentally, the transfer of value at the speed of software if it's a security." For me, this comment and its conclusion telegraphed something profound about one of XRP's use cases. While there is tremendous potential in XRP being used for micropayments and for remittance processing, the biggest use case - that of Nostro-Vostro account replacement and XRP's use as a bridging asset between fiat and cryptocurrencies - hinges on its regulatory treatement. If you're following the regulatory news that could potentially impact the XRP ecosystem, I highly recommend that you watch both of these sessions in their entirety to obtain an intuitve grasp of the regulatory direction. The videos were lengthy, and I watched some sections multiple times. While I think that Ripple's ILP solutions will be used by central banks, I was even more positive about the XRP Ledger being used by banks after watching the testimony in the House Agriculture Committee's hearing on cryptocurrencies. For those closely tracking XRP volume levels, keep in mind that SBI VC is just getting started, and applications for membership take some time to process, as indicated by SBI's press release. These are not the same group of investors that are already in crypto; these are more traditional retail investors, as well as ForEx traders, representing an entirely new demographic for cryptocurrency trading. It's an exciting development, and the XRP Community should watch closely in the coming days for volume differences that can be traced to the Japanese market. "Part of what we've done at Ripple, is made that experience (moving money with crypto) a good one. For example, there is an issue with volatility; but using our technology, if they want to move money into Mexico, for example, they're seeing the US dollar - to - Mexican Peso rate, and they're only exposed to the volatility as it transfers across the different systems for a few seconds. So, if they want to send one hundred dollars' equivalent into Mexico, they're guaranteed to get one hundred dollars' equivalent in Mexico. And that's just really been about trying to understand the customer experience we want to deliver; and then, wrapping that up into a good product experience for our customers. And we're seeing that banks are not the first adopters of the digital asset product (xRapid); but upstart financial institutions are really adopting that product and moving a lot quicker - especially in the emerging markets." This makes even more sense to me after watching the Congressional hearings. It was pointed out in one of the hearings that remittance processors such as MoneyGram and Western Union are governed by a clear set of rules known as 'money transmitter' rules, while banks are subject to a different regulatory framework. For this reason and also banks' generally conservative nature - Asheesh Birla also mentioned this in the context of his discussion in the video - money transmitter companies and smaller start-ups will be the first ones to leverage Ripple's xRapid solution. However, keep in mind that while there may be reluctance to be a first adopter of digital asset usage, banks seem to be jumping aboard Ripple's ILP-based products with no hesitation; this includes xCurrent and xVia. Question: "Ten years from now, how will people interact with banks to move money? Cassie, your vision?" Answer (Cassie Craddock): "....Ten years from now, if Ripple is successful, that means international payments should happen in 3-5 seconds anywhere around the globe. A guy that wants to send his child money from Asia to the UK because he needs rent; that is a real-life use case that we do today. We can offer real-time settlement of transactions in three-to-five seconds. If we can do that on a global scale, which is Ripple's vision, I think the banking sector and financial services as a whole will be the real winner." The interesting thing about the question was that Amit was asking about ten years from now; Ripple is able to effect these changes in the present day as Cassie indicated. There's no need to wait ten years for Ripple to transform payments; the future is now. 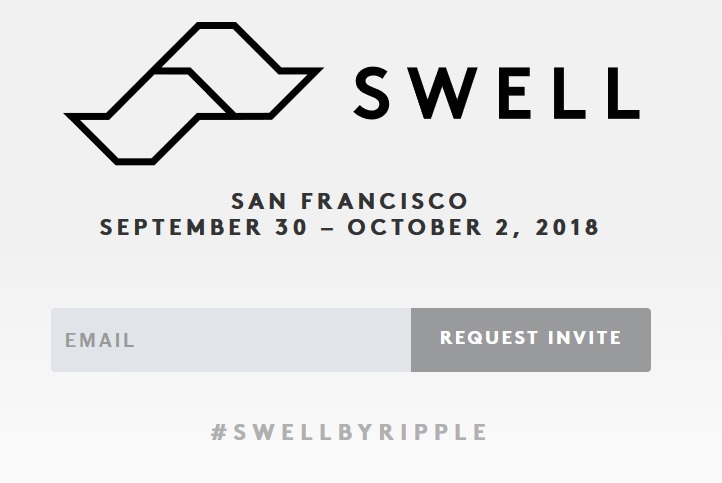 We knew that SWELL would happen again in 2018, and it's amazing that time has passed so quickly, with incredible progress for XRP and for the entire XRP ecosystem. I think this is a good move for Ripple. While 2017 was their year to elevate Ripple solutions to noteworthy status among banks, the positioning of Ripple's cross-border products as the modern replacement to SWIFT messaging has already been started. Now Ripple is seeking to establish their own independent, annual conference for banks that wish to upgrade their capabilities with blockchain technology. Good luck to the Ripple team responsible for planning this year's conference; it will be a challenging task to out-do last year's keynote speaker list. Retail business payment integration doesn't get enough exposure in the XRP ecosystem. We have Ripple focusing on banks, financial institutions, and remittance processors. We have Coil focusing on Internet content creators and micropayments. We have Omni focusing on using XRP for the sharing economy. But how many retail businesses accept XRP? Do we have a comprehensive community listing? First business in Clarksville, TN to accept $XRP as payment in-store. This payment option will be available to our customers at all of our current and future brick-and-mortar locations. Next time I stop in Clarkesville, I'll be spending some zerps at Natural Selection Meal Prep! The crypto market - and XRP's adoption by banks, remittance processors, corporates, and Internet content creators - is only going to get more frenetic from here on out. Prepare yourself to keep up-to-date on developments and news items that may impact your crypto portfolio. The number of individuals getting into crypto trading - and into XRP - is just beginning. Crypto advocates and investors are a small minority of the population, and traditional investors are just starting to enter the space; SBI VC is one of the first exchanges that will act as a bridge for these traditional investors, so it will serve as a type of barometer for how much demand exists for crypto trading by mainstream investors who may have been introduced to the concept by the younger generation. Will LINE's user base bring crypto past the trillion-dollar capitalization mark in 2018? I believe that the crypto market will test that boundary soon, whether or not LINE's crypto exchange is the catalyst. As an XRP owner, I am confident that my long-term investment is where it needs to be for the best possible appreciation. With XRP ecosystem stakeholders like Ripple, Coil, remittance processors, banks, various Internet companies, and XRP Community developers, the odds are very good in my view. So good, in fact, that I have a difficult time comprehending why any other choice in the crypto market even comes close; will XRP rise to the top of the rankings by the end of 2018? I believe it will. While each of us must make their own investment decisions and do their own research, I've done mine, and I continue to dynamically evaluate my assessment. With each passing day, it's obvious to me which cryptocurrency network is on the forefront of fulfilling the promise of moving money as easily as sending a text message.